Volunteer and make a difference in the lives of cats and dogs in need! Since 2005, Pawsitive Alliance has helped over 7,000 homeless kittens, cats, puppies and dogs find forever homes and provided thousands of low cost spay and neuter surgeries. We couldn’t do what we do for the animals without the support of dedicated and compassionate volunteers. 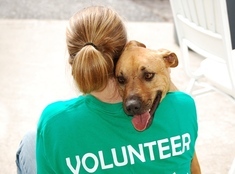 Become a volunteer and make a difference for pets! Pawsitive Alliance is always needing energetic and compassionate animal lovers who want to put their skills and energy to work for the animals. If you interested in using your time, talent, and energy to support the vision of a healthy and happy home for every cat and dog in Washington then contact us at info@pawsitivealliance.org. If you are a skilled graphic designer or even a student learning the trade, and interested in lending a helping paw to help find forever homes for pets in need please email info@pawsitivealliance.org. The #WhyNotMePets campaign is a collaborative marketing campaign that gives the homeless cats and dogs who need more care and attention a chance to find a home as quickly as possible; they are the ones left asking “Why Not Me?". The campaign currently focuses on Washington's homeless cats and dogs that have been homeless 2 months or longer; are elderly, have behavior or medical needs, or aren’t thriving in the shelter environment; and, the animals that make up a large percentage of the shelter population, such as bully breeds. Photographers visit the pet at the adoption agency or off site locations and take fun and unique photos to highlight the pet's personality. Writer's utilize the information known about the pet's history and personality into a fun write up. The photos and story are used to debut the pet and keep attention on them until they adopted. These elements are critical in getting the #WhynotMEpets adopted. If you like to help dogs and cats in need then get involved with organizing our programs and events throughout Puget Sound and communities across Washington. Many activities can be done from home and there are also opportunities to participate in events with dogs and cats in fun settings. Please contact us at info@pawsitivealliance.org o get involved. Please contact us at info@pawsitivealliance.org o to get involved.